How to Handle Depression associated with Chronic Pain — How are they related? For those suffering from chronic pain, it seems like it goes hand-in-hand with depression. Living with chronic pain can be physically and mentally debilitating. Depression magnifies pain and makes everyday living more difficult. Fortunately, effective medications and psychotherapy can help separate the two and helps make both conditions more tolerable. If you suffer from depression due to chronic pain – you are not alone. According to the National Institutes of Health, chronic pain is often defined as any pain lasting more than 12 weeks. Whereas acute pain is a normal sensation that alerts us to possible injury, chronic pain is very different. Chronic pain persists—often for months or even longer. Chronic pain may lead to low energy, mood disorders, and impaired physical and mental performance. You can often experience pain in other areas of your body that, given the original source of your pain, would not normally hurt. Such long-term pain can lead to sleep disorders or can awaken you frequently during the night. This sleep deprivation can lead to fatigue, low productivity, and mental fogginess during the day. Chronic pain can also lead to irritability, depression, and even suicide for those who feel there is no hope for relief in sight. According to the American Pain Foundation, about 32 million people in the U.S. report having had pain lasting longer than one year. From one-quarter to more than half of the population that complains of pain to their doctors are depressed. Because depression in patients with chronic pain frequently goes undiagnosed, it often goes untreated. For many people, the two seem inseparable, however, managing the pain can provide relief for the depression as well. Pain symptoms and complaints are the leading cause for most doctor visits. As we are all aware, sudden pain triggers an emotional response. If you have pain, you may also experience high anxiety, irritability, and agitation. These are very normal feelings when you’re in pain – for everyone. Normally, as the pain subsides, so does the stressful response. Unfortunately, with chronic pain, you may feel constantly tense and stressed. This stress can actually lead to a greater sensitivity to pain. Over time, the constant stress can result in different emotional problems such as those associated with depression. 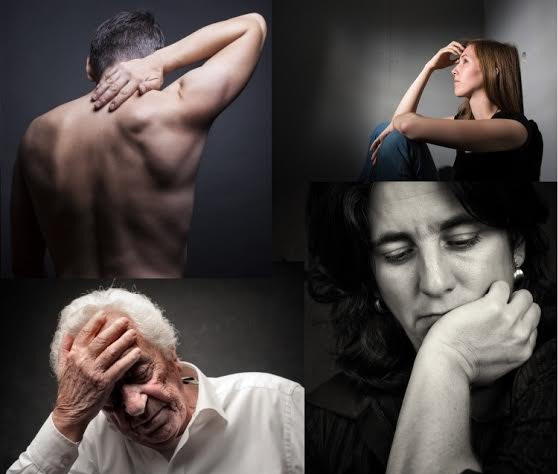 People with both chronic pain and depression often deal with moodiness or irritability, anger, chronic anxiety, family stress, fatigue, weight gain or loss, and work-related issues. Antidepressants are used to treat the combination of chronic pain and depression. These drugs work on the nerve centers in the brain to reduce the perception of pain. Certain antidepressants known as serotonin and norepinephrine such as Cymbalta and Effexor (generic – Venlafaxine Hcl) are used to treat depression. Venlafaxine is known as a serotonin-norepinephrine reuptake inhibitor (SNRI) and works by helping to restore the balance of certain natural substances (serotonin and norepinephrine) in the brain. The drug may improve your mood and energy levels and may help restore your interest in daily living. Venlafaxine may also be used to treat anxiety, nerve pain, and panic attacks as well as hot flashes that occur with menopause. Can Exercise Help Both Chronic Pain and Depression? Many people that suffer from chronic pain or depression avoid exercise. Avoiding exercise can cause you to get out of shape and can increase your risk of injury and even worsen your pain. Talk to your doctor before beginning an exercise regimen. Your healthcare professional can help you to design an exercise plan that’s safe, yet effective for you. A simple walk in nature can help remove the stress and discomfort of chronic pain. Exercise releases the same kind of brain chemicals mentioned above and helps ease depression. The best approach to managing chronic pain and depression is to team up with your doctor or pain specialist to develop a treatment plan. The ideal plan will include options not only to treat your pain but your depression. Treating your pain will often help treat your depression. Finding cost-effective solutions to your chronic pain and depression can be overwhelming. If you are uninsured or under-insured you may be paying more than you need to for medications like Cymbalta and Effexor or other antidepressants at your local pharmacy. Our free prescription drug card can help alleviate the high cost of antidepressant prescriptions. Simply download, email, print or text our card at EasyDrugCard.com and begin saving on your prescriptions at your favorite pharmacy. The card works like a coupon providing discounts on all prescription medications. Use our pharmacy locator and drug pricing tools to find the best price near you.